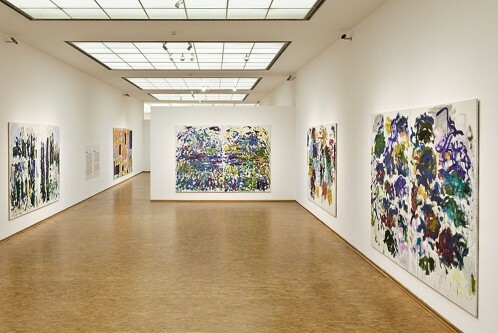 The Museum Ludwig is presenting ‘Joan Mitchell, Retrospective. 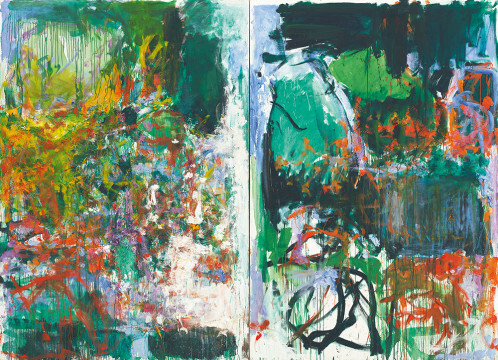 Her Life and Paintings’ a tribute to one of the only woman of the second generation of American Abstract Expressionists. Along with Jackson Pollock and Franz Kline she developed a language of herself, depicting with expressiveness and assertion. For this retrospective the Museum Ludwig displays an wide array of Mitchell’s works from the 1950s until her final year in 1992. The corpus of the artist can be clearly separated into two phases. One going until the early 1980s, and one following this years that marks her diagnosis with oral cancer. This second phase implements the idea of decay. Both periods are inspired by landscapes and the indoors. They are shaped by her intensive brushstroke as seen with ‘Ladybug’ (1957) or ‘La Chattier’ (1960). Works described by the artist as ‘very violent and angry’ and that guided Mitchell ‘to get out of a violent phase and into something else.’ This something else will be more geometrically formulated as shown with ‘Close Territory’ (1973) and ‘Un garden pour Audrey’ (1975). Along with the oeuvre of the American painter, the retrospective displays intimate photographs showing Mitchell over the years. At times with her dog, at time playing dress-up. The exhibition offers therefore an inside-out overview of Mitchell’s life and works.